It's 2019 and you need to receive a fax. What do you do? You could buy a fax machine, hook it up to a phone line and hand out your number. But it's 2019 not 1979, we're living in the future, so let's grab Node.js, pick a couple of APIs and turn that fax into an email instead. You're going to need a Twilio account, a SendGrid account and this noise to remind you what you're missing out on as you build your very own fax-to-email converter. When you have a number ready to go we're going to need to set up to receive some web hooks. You might think fax would work the same as messaging, but it's more like voice calls. We need to respond to two incoming webhooks. For the first one we have two choices: to receive or reject the fax. We can do this with the <Receive> or <Reject> fax TwiML verbs. Rejecting an incoming fax hangs up the connection and we're done. Opting to receive an incoming fax means Twilio will answer the incoming call and receive the fax on your behalf. To do this, we need to set a second webhook URL as the action attribute of the <Receive> element that will be requested when the fax has been fully received. This second webhook is where we're going to do all the work of downloading the fax as a PDF and sending it as an email. We'll build this as a Twilio Function using Node.js (though you can do this in any language and host the application yourself). 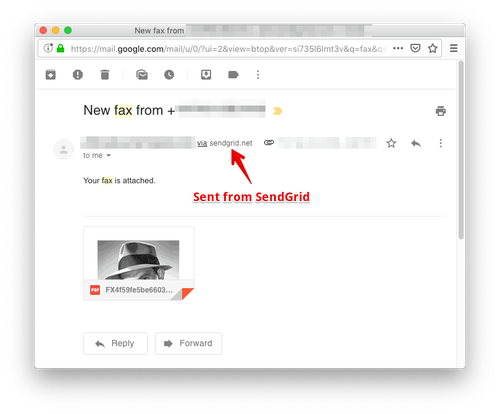 We're going to use the request npm module to both download the fax PDF file, like my teammate Sam did with media in MMS messages, and also to send it on to the SendGrid API. Open up the Twilio console's Runtime dependencies section and add request version 2.88.0. While you're in the config section, create an API key in your SendGrid account (make sure it has permission to send emails) and save it as an environment variable called SENDGRID_API_KEY. Create a new Function and choose the blank template. We'll start the code off by requiring request and creating the handler function. We're going to download that PDF with request. To send it on to the SendGrid API, we're going to need it as a Buffer and we can do that with request by setting the encoding to null. Now we've built up the email, we need to send it to the SendGrid API. We'll send as JSON, packaging the email object we've created here as the body and adding the API token we created earlier as authorization. Save the number config and you're ready to receive your faxes as emails. As we already established, it's 2019 and we don't have a fax machine to test this with. Now, you can either head down to your local library or print shop and ask to borrow theirs, or pop open the Twilio API explorer and send yourself a fax via the API (you can use your existing fax number as both the To and From number here). When sending a fax you need to have a PDF hosted somewhere that Twilio can reach it. If you don't have one, feel free to use our test PDF file here. Don't forget to play the authentic sounds of a fax machine as you send it off into the world. 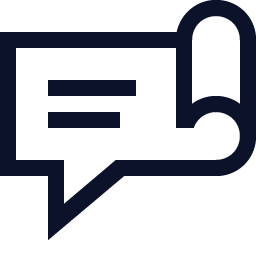 We've seen how to use request to download files and then post them directly to the SendGrid API. You could use the same technique to forward incoming MMS messages to your email too.